(Newser) – The British phone-hacking scandal just became even more damaging to British Prime Minister David Cameron. 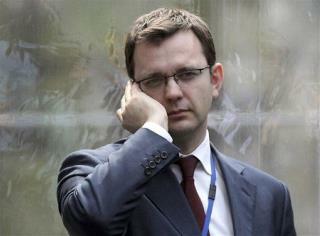 Former News of the World editor Andy Coulson remained on the News International payroll for six months after being hired as Cameron's communication director, receiving hundreds of thousands of dollars from the Rupert Murdoch firm while working in a sensitive role for the Conservative Party, the BBC reports. Coulson, who stepped down earlier this year as phone-hacking allegations spread, was arrested last month. Meh. We have the same thing here. It's called "The Republican Presidential Candidates". I wonder whose in the dole in America's government.